When love is in the air, so are scams. 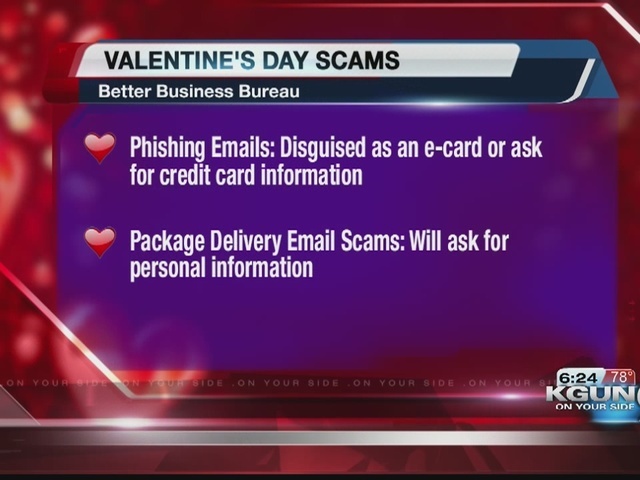 The Better Business Bureau is warning online daters about Valentine's Day-related gambits. Phishing emails that get victims to give up your credit card info. "Catphishing," in which con artists start up relationships with the intent to soak a victim out of money. Package delivery services that ask for personal info. When it comes to online dating, the BBB warns against those who ask to use personal emails or phone numbers immediately, immediate claims of being in love, those claiming to be in the U.S. but traveling abroad and requests to wire money.